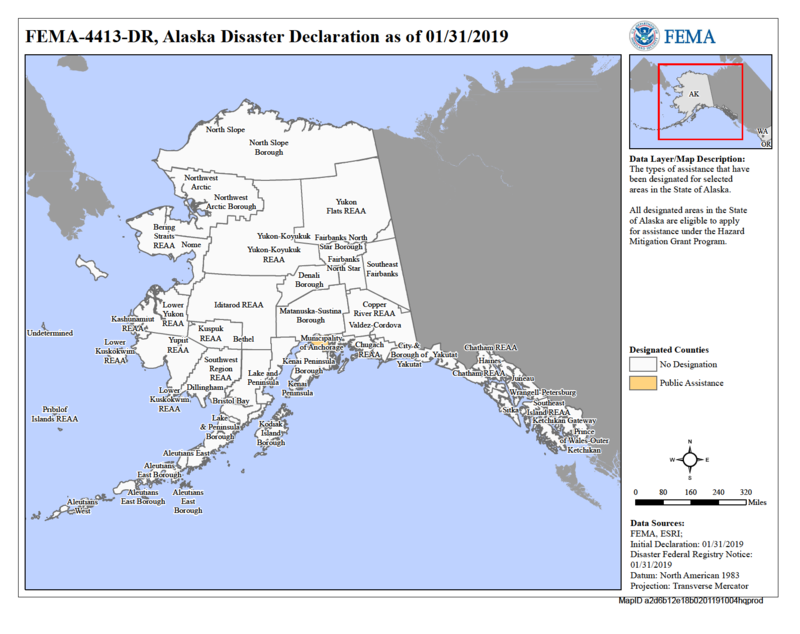 Homeowners, renters and business owners in the Municipality of Anchorage, Matanuska-Susitna Borough, and Kenai Peninsula Borough who suffered loss or damages due to the earthquake on Nov. 30, 2018 may register for federal disaster assistance. If you were affected by the earthquake and need assistance call 800-621-3362 (TTY users may call 800-462-7585) or visit www.DisasterAssistance.gov. You will need to apply separately for the FEMA Individual Assistance program, even if you already registered for the State Individual Assistance program. Federal assistance can augment what is available from the state, and requires a separate registration. Low-interest disaster loans from the U.S. Small Business Administration (SBA) are available for businesses of all sizes (including landlords), private non-profit organizations, homeowners and renters. Disaster loans cover losses not fully compensated by insurance or other recoveries; however, an SBA applicant does not need to wait for their insurance settlement. SBA applicants may apply online at DisasterLoan.sba.gov. Information about low-interest SBA disaster loans and application forms are available online at SBA.gov/disaster or by calling 800-659-2955 (TTY users call 800-877-8339) or via email to DisasterCustomerService@sba.gov. Call SBA at 800-659-2955 to have an application mailed to you. Hours: Mon-Fri, 9a.m. to 7p.m. 2635 S. Old Knik Rd. Hours: Mon – Fri, 9a.m. to 7p.m. Hours: Mon-Fri, 9 a.m. to 7 p.m.
American Sign Language interpreters are available by request. After registering for disaster assistance, you may be contacted by a housing inspector to schedule an inspection. The inspection generally takes about 20-40 minutes. The inspector will want to see the damaged areas of your home and any damaged furniture and personal property. There is no fee for the inspection. FEMA inspectors will have an official FEMA photo ID badge. On the day of the inspection, you may ask the inspector to show their badge. If an inspector refuses to show identification, do not allow the inspection. Disasters sometimes bring out scam artists who prey on the needs of disaster survivors. All disaster-related damages to both real and personal property. Inspectors will not ask for your Social Security number or bank account information. If the home was found to be inaccessible at the time of inspection, the applicant is required to let FEMA know when the home is accessible and request a new inspection. To update the status of an uninhabitable dwelling, applicants should call the disaster assistance helpline at 800-621-3362. Once the inspection is complete, FEMA will use the information to review your case and send a letter to you outlining a decision. Read this letter carefully. Many times ineligibility is due to FEMA not having important information, such as proof of ownership or proof of occupancy. You have 60 days to appeal a FEMA decision. The appeal process is detailed in the letter. Q: My FEMA determination letter says my application for disaster assistance is “ineligible” or “incomplete.” What can I do? A: All disaster assistance applicants have the right to appeal, and sometimes a quick fix is all that is needed to change a “no” to a “yes.” Read your letter all the way through to clarify why your application was labeled “ineligible” or “incomplete.” Always be sure to follow up—do not just give up—with the determination letter. Q: I want to appeal my determination letter. How can I do that? A: All appeals must be in writing. When writing your appeal, explain why you think the decision about the amount or type of assistance you received is not correct. You, or someone who represents you or your household, must sign the letter. If the person writing the letter is not a member of your household, there must be a signed statement from you explaining that the person may act on behalf of you and your household. Q: What do I do with my written appeal and my other appeal documents? A: Bring your determination letter, your written appeal and the supporting documents requested in your determination letter to any disaster recovery center. For locations visit www.fema.gov/DRC or Call the FEMA Helpline at 800-621-FEMA (3362). Q: I cannot make it to a disaster recovery center. Can I still appeal my determination letter? Fax your appeal packet to 800-827-8112, Attention: Individuals and Households Program. When mailing or faxing your appeal packet, be sure to include your personal FEMA registration number and the disaster number, DR-4413-AK, on all your documents. Your letter must be postmarked within 60 days of the date on your determination letter. Q: Can I email my appeal packet to FEMA? A: No. FEMA cannot process your appeal via email, but you can submit it on our website. You can open a disaster assistance center account at www.DisasterAssistance.gov. Once the account is created, you can update your current contact information, upload your appeal documents and review letters from FEMA. When you upload the required documents to your account, an appeal packet is automatically created which can then be submitted for review. Q: Why am I, an individual, being referred to the U.S. Small Business Administration for my disaster-related losses in the Alaska earthquake? A: Don’t let the name mislead you. During a declared disaster, SBA provides low-interest, long-term disaster loans to homeowners and renters who aren’t adequately insured as well as businesses of all sizes and private nonprofits. Many applicants who register with the Federal Emergency Management Agency are also referred to the SBA during their registration for disaster assistance. If you meet the SBA income criteria, you must complete and return the loan application to ensure the federal disaster recovery process continues. Q: How do I submit my SBA loan application? A: You can meet with an SBA representative at any of the joint FEMA-state disaster recovery centers in designated disaster areas. Q: How does an SBA loan work with my homeowner’s insurance? A: Do not wait on a settlement before submitting an SBA disaster loan application. SBA may be able to finalize the loan and get money to you before your insurance settles. The loan balance will then be reduced by the insurance settlement if you receive one. SBA disaster assistance may be available for losses not covered by insurance or other sources. Q: Will I need to have another home inspection? FEMA and the state have already done inspections. A: Yes. An SBA verifier will estimate the total physical loss to your disaster damaged property. Q: How much can I borrow from SBA? A: Homeowners can borrow up to $200,000 for primary residence structural repairs or rebuilding. Homeowners and renters may be able to borrow up to $40,000 to replace personal property including automobiles damaged or destroyed in the disaster. Businesses of any size may borrow up to $2 million to repair/replace disaster property damage. Small businesses, small businesses engaged in aquaculture and most private nonprofit organizations may also borrow to help meet disaster caused working capital needs. The $2 million maximum applies to the combination of property damage and working capital loans. Q: What happens if I am denied a loan from SBA? A: If the applicant is denied a loan, FEMA’s Other Needs Assistance program, for items such as personal property (i.e., clothing, household items), moving and storage costs, and car repairs may be available. Certain items (i.e., chainsaws, dehumidifiers) may also qualify if they were purchased or rented to return a household to a safe, sanitary and functional state after the earthquake. Q: What happens if I am approved for an SBA loan? A: If the applicant is approved by the SBA, the intent is for these low-interest, flexible loans to cover these additional needs and for repairs not covered by your FEMA assistance. Q: What if I am approved for an SBA loan, but choose not to accept it? A: If you choose not to accept the SBA loan, you will not be eligible for further federal disaster assistance, but you may be referred to local voluntary agencies for assistance. Temporary Housing Assistance – reimbursement for lodging or rental costs resulting from displacement due to the earthquake for up to 18 months or the program maximum. Repair Assistance – grants for repairs to return a home to a safe, sanitary and functional state. Replacement Assistance – a grant toward the purchase of a home if the primary residence was destroyed in the earthquake. Also, regardless of SBA’s determination, applicants may be eligible for assistance with medical, dental, child care and/or funeral costs related to the Alaska earthquake. FEMA mitigation specialists will visit home improvement stores April 22-27 in Willow and the Municipality of Anchorage to offer advice on how to repair and rebuild structures to be safer and stronger. The workshops will also offer home improvement tips and share proven methods to prevent or reduce damage from a disaster. Most of the information and free publications are aimed at general contractors and those willing to take on do-it-yourself projects. Hours: 9 a.m. to 5:30 p.m.
Alaska Careline - call 877-266-4357 (HELP) 24 hours per day/seven days per week, or text 4help to 839863. Text line is open Tuesday-Saturday, 3-11 p.m. You can also visit www.CarelineAlaska.com. The U.S. Department of Health and Human Services’ Disaster Distress Helpline provides confidential crisis counseling and support 365 days a year to people experiencing distress related to disasters. Multilingual available. Call 800-985-5990 or text TalkWithUs to 66746 to connect with a trained crisis counselor. For support or referrals to services in your area, call the statewide information and referral line at 211. When disaster strikes, every little bit helps. To make the most of your contributions, please follow our guidelines to learn the most effective and safest ways to donate cash, goods, or time following a disaster. Cash is best. Financial contributions to recognized disaster relief organizations are the fastest, most flexible, and most effective method of donating. Organizations on the ground know what items and quantities are needed, often buy in bulk with discounts and, if possible, purchase through area businesses which supports economic recovery. Confirm donations needed. Critical needs change rapidly – confirm needed items BEFORE collecting; pack and label carefully; confirm delivery locations; arrange transportation. Unsolicited goods NOT needed burden local organizations’ ability to meet survivors’ confirmed needs, drawing away valuable volunteer labor, transportation, and warehouse space. Connect to volunteer. Never Self Deploy During a Disaster. Trusted organizations operating in the affected area know where volunteers are needed, and can ensure appropriate volunteer safety, training, and housing.